Proving that theater isn't just for adults, Beef and Boards Dinner Theatre once again demonstrates its ability to find a way to introduce live arts to the below 21 age group. 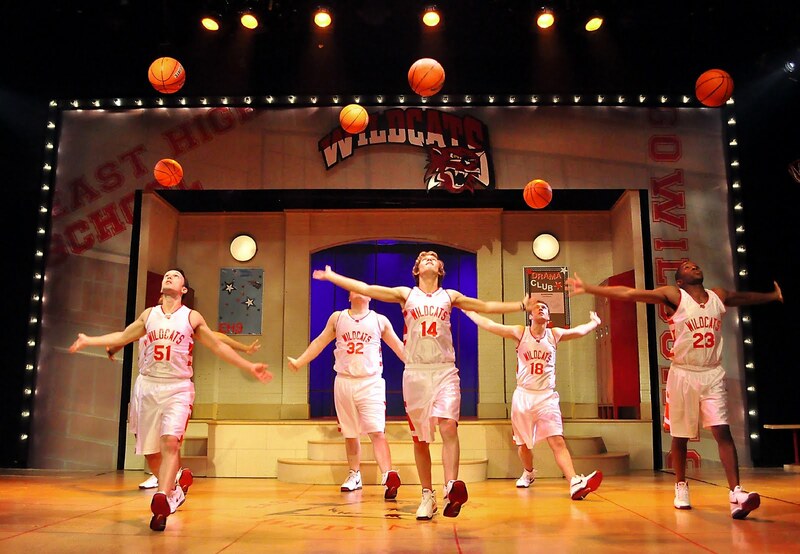 Disney's High School Musical, seen everywhere from the television to the ice rinks, is now being performed as a live production. Basketball heroes, cheerleaders, shallow drama queens and science geeks converged on the north side of Indy. A sweeter, less foul-mouthed storyline similar to The Breakfast Club, (1985) showcases the stereotype teens afraid of asserting their independence against authority figures. Without the hard, and more likely scenarios in the typical high school, these teens don't swear, smoke marijuana or ridicule janitors. They do, however, dance, sing and juggle basketballs in unison. The message is strikingly familiar...be the person you want to be, regardless of what peers and adults want. With the jocks, the drama kids and the brainiacs, the show attempts to give a good idea of school cliques, both kids and adults. 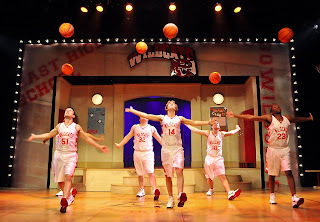 Basketball hero Troy Bolton (Ti m Barsten) and science and math whiz Gabriella Montez (Jessica Ann Murphy) dare to follow their hearts and cross the line by mustering up the courage to tell their friends they want to be in the school drama performance. Murphy's vocals, Start of Something New, were certainly the best of the evening. Bolton in the duet with Murphy, gained confidence as the show went along. Eddie Curry, director, and Ron Morgan, choreographer, make excellent use of space allotted by a theater, instead of movie, stage. Divvying up the set into thirds executes the science lab, gymnasium and drama room convincingly. Scenic and lighting designer, Michael Layton creates a dynamic solution to a difficult situation. Back-and-forth moving between the various areas of the school could have been bothersome to the audience and actors alike. However, his design smooths the seams nicely, with extra input from a local Brownsburg teen. Tim Hills was born with an extra c hallenge allowing him the edge to solve complex stage settings. With Cerebral Palsy giving him the needed push to focus intently on using his only usable finger, Hills concentrates on one problem at a time. Sending a letter to Layton, the west-side youth explained in detail how best to set up the stage for maximum benefit. 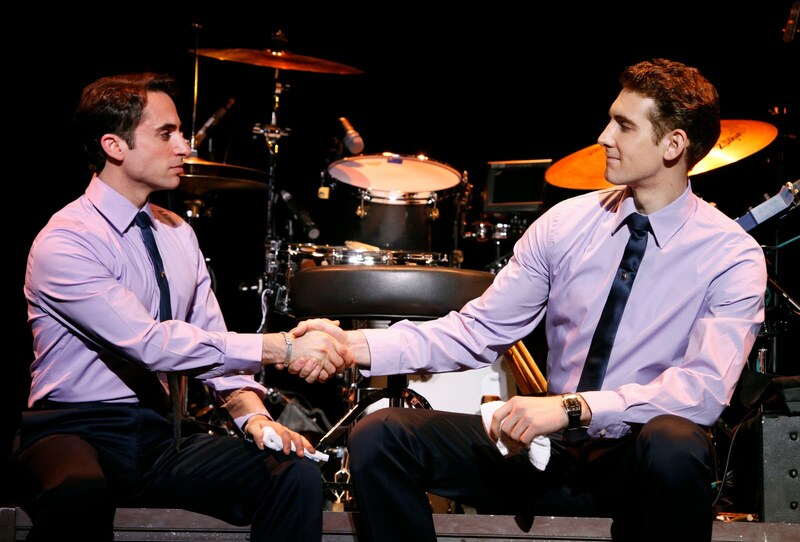 Layton met with Hills and solicited him as the show's scenic design associate. Destination Actor Jeff Stockberger portrays the headstrong head coach and Troy's dad perfectly, mellowing out at the end a nd giving a little taste of his comedic timing. Bantering with Ms. Darbus the drama coach, played by Karen Pappas, allowed the two to demonstrate their comedic chemistry. Another show with just the two of them would not be out of order, if the amount of audience laughter indicative of success. 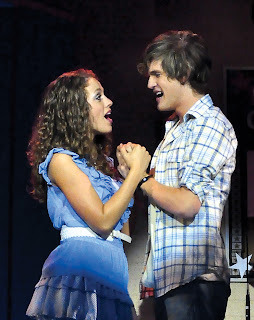 Other notables include, J. Tyler Whitmer as Ryan Evans and Shavanna A. Calder as Taylor McKessie. Bottom Line: This made-for-kids popular show teaches a great and positive lesson in an entertaining way. Elizabeth J. Musgrave is a syndicated columnist, theater critic, and travel writer. You can now follow her on facebook and catch her as Indy's Arts & Entertainment Adviser on 93 WIBC's Saturday Morning News Show, giving a quick Gotta Go list of things to do in the Indy area, including restaurants, festivals, events, theater, and films. If you are fortunate enough to review theater long enough you will come across performances which sail above the majority. I have been that fortunate, on a few occasions, to witness the short list of shows setting a standard to which others strive to match. 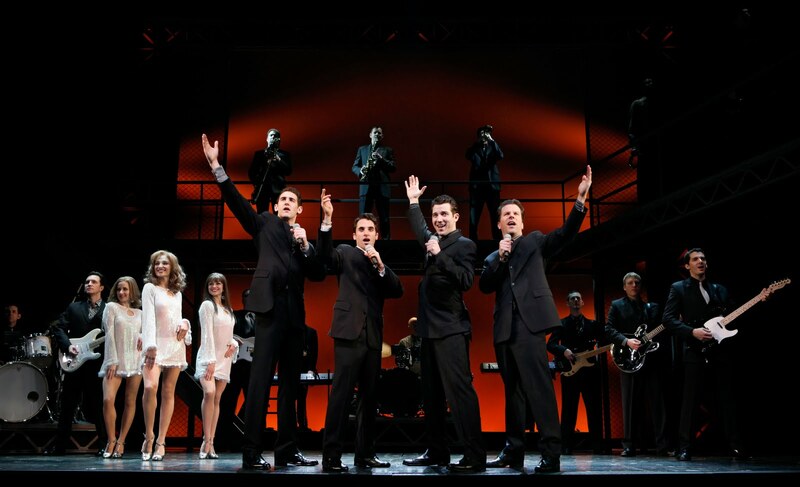 Broadway Across America's Jersey Boys is one of those shining stars. Four boys from the wrong side of Newark (is there a right side?) 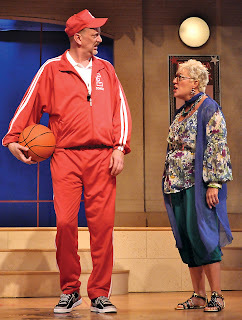 Walk Like a Man onstage at The Murat Theatre, 502 N. New Jersey St., through July 3. The Tony and Grammy award-winning show hits every note and every emotion at full throttle and with an Italian sledge-hammer intensity. In the gritty New Jersey jungle where you, "Join the Army, get mobbed up or become a star," four street thugs scratch, bribe and threaten their way up the ladder of pop idol stardom. Golden egg and falsetto-voiced teenager Francis Castelluccio-Frankie Valli (Joseph Leo Bwarie) becomes lead singer for the ever-turbulent band which eventually settles on the name The Four Seasons. Other members of the group include bad boy Tommy DeVito (Matt Bailey), neurotic, brooding Nick Massi (Steve Gouveia) and songwriting child prodigy Bob Gaudio. With a street-tough stage and an in-your-face approach, the audience is delivered a documentary musical ripe with behind-the-scenes juicy details including, prostitutes, failed marriages, fights, jail time, blood, booze, certain Italian affiliations and loan sharks...kind of like a mob movie, complete with Joe Pesci, set to amazing music. Shed your rose-coloured, dreamy pop icon glasses at the door, folks, 'cuz this ain't no group of Catholic choir boys. These almost-wise guys have each others' backs, secrets and loyalty. Their rise to fame was no walk in the park. Each of the four members takes a metaphoric season giving a blow-by-blow account interjected with several of the 29 No. 1 hits. Belting out the songs (Sherry, My Eyes Adored You, Big Girls Don't Cry, Walk Like a Man) in rapid-fire, concert-style succession, gives definition to the lyrics' origins, including Oh What a Night, about Gaudio's loss of virginity. Swearing like, well, guys from Jersey, the finger-snapping, dapper-dressed, well-choreographed group lays it all out there...judge them and take a chance on their wrath, because they are not ashamed. Like them or not, they are who they are...American born and American proud. Rising to fame and fortune was not easy and they earned every penny. Selling 175 million albums, the Hall of Fame inductees parted ways when financial disaster, through De Vito's gambling mishaps, was brought to light...by the loan sharks. After pledging to the mob that he would pay back every penny owed by his Jersey buddy, Valli, along with Gaudio, continued on with touring. Massi departed from the group at that time, citing a need to be home with his family. The show's final 'season' was narrated by Valli's account of going solo. Always the idealists, Gaudio and Valli conti nue their handshake partnership, dividing all monies gained through solo ventures, remaining best friends to this day. Whether over, or under, the appropriate age to remember this group's rise to fame, chances are you know the music, lyrics and songs. Although not as great as the real thing, this version of Valli and the Four Seasons is as close as you could hope to find. As a writer, you may find it strange when I say there are not enough words in Mr. Webster's dictionary to explain the phenomenon going on at The Murat Theatre, so I will put it succinctly. Bottom Line: DO. NOT. MISS. 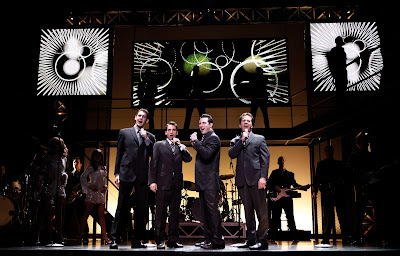 Jersey Boys...for any reason. 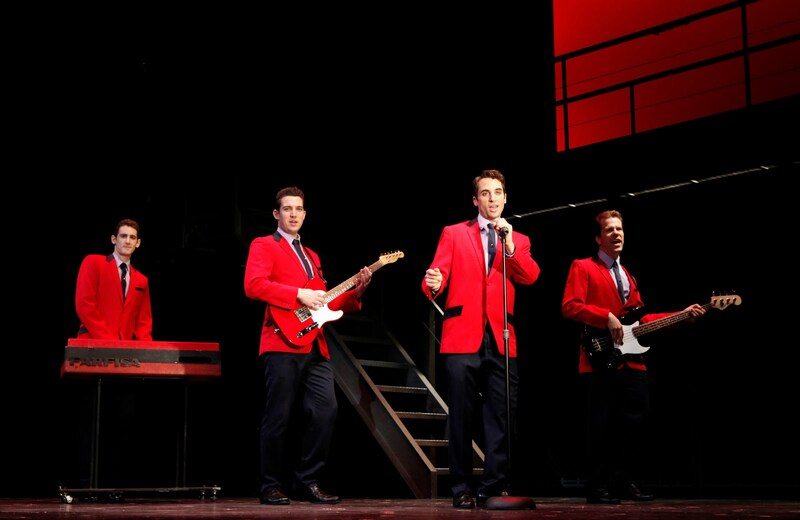 Lie, cheat, steal...whatever it takes...Jersey Boys is the one you do not want to miss for the 2009-10 season.